Take your display to the next level with the L27ADS 27â€ monitor from V7. 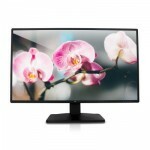 Featuring Full HD 1920x1080 resolution and 300 nits brightness you can maximize your screen space with 27â€ of viewing. With an ultra-thin frame bezel, this monitor is perfect for multiple display setups, plus itâ€™s wall mount ready with a 100x100 VESA pattern. Designed for maximum connectivity the L27ADS has HDMI, DVI and VGA input options, and it completes the multi-media experience with 2x2W built-in speakers.